This section contains a variety of different activities that pupils may complete and bring into school if they wish. The activities will include activities that will enable children to access a variety of their learning skills. Activities will be marked by the teacher and a certificate will be awarded. Staff will also award certificates for extra work completed at home related to current class topics. 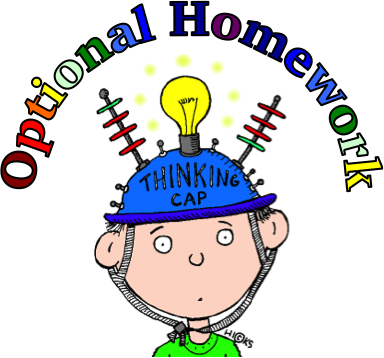 Click on the link below to see this half-terms optional homework.